Ahoy there, matey! Every year September 19 marks the spot for International Talk Like a Pirate Day, a chance to let your inner pirate out and use the word “booty” to your heart’s content. In case it’s been a while, here’s a pirate refresher to help you find your inner pirate voice. Double up on your adjectives. Pirates are known to be animated and verbose. Drop the “g” and “v” sounds from your words. Use “Arr” all the time, especially when the ride gets tough! It’s a catch-all exclamation that you can use for most emotions. Find your inner growl; roll your Rs and grumble often. 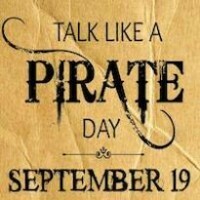 And don’t forget that pirates are known for their insults, so have your arsenal ready. Here’s a list of common pirate words and their English definition. And if you’re looking to say something specific, check out this English to pirate translator. Now gulp your favorite grog while creating your playlist from the list below.